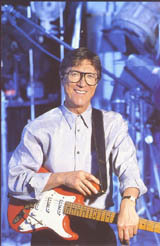 LATEST NEWS:- Easy-Mute Hank Marvin System. Recently we managed to secure the return of our original CNC set-up discs and tooling jigs for the De-Luxe knob. 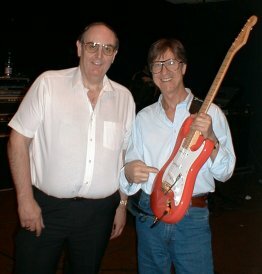 As a result, the range of Easy-Mute Guitar Tremolo Arms is back in full production, including the Hank Marvin System, in the polished stainless steel and gold-plated versions. These are available for either right or left-handed use, in USA, Metric/Mexican (early and late types). (Including a stepped-shank one for PRS guitars). Normal Length is 130mm, but 110mm and 155mm versions are also available. 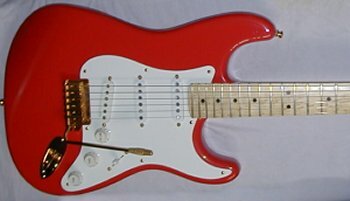 A plug-in version, to fit the Fender Deluxe Bridge, is available only on a "made to order basis" at an additional cost of £5.00p, added to the corresponding screw-in version. Please note that the De-Luxe Knob cannot be purchased as a seperate item. Once you have fitted one of these revolutionary trem. arms to your guitar you will never want to go back to the original arm. 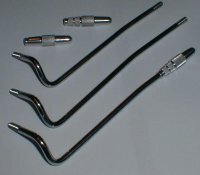 Available in STAINLESS STEEL, The Easy-Mute Guitar Tremolo Arm can be supplied with American or metric thread, and in 3 sizes, without a tip or knob. 'Easy-Mute' Guitar Tremolo System, complete with plastic tip, in stainless steel @130mm long = £37.00p. Plastic tip colours available are 'Bright-white', 'Aged-white' and 'Black'. All VML products can be ordered by e-mail or by using the order form on these pages. For UK customers, Please add £4.00 for packing and recorded delivery. Will non-UK customers please contact us for the current shipping charges. and make your payment to the email address below.